We are looking forward to checking out the new Banksy movie "Exit Through the Gift Shop" tomorrow in the pop-up cinema Banksy has built in Leake Street. The movie itself goes on generally release next week, March 5th. To tie in with the release of the film, Banksy has produced an exclusive piece of cover art for the next issue of Time Out London magazine which is set to go on sale tuesday March 2. According to Time Out "the cover, a mixture of self-portraiture and spraypaint, is unlike anything he's ever done for a magazine before and may never be repeated." 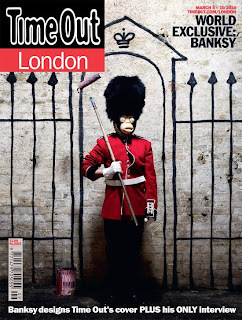 In addition to the cover, Time Out London's Visual Arts Editor, Ossian Ward, conducted a rare interview with Banksy. The Time Out online shop will have some exclusive editions of the magazine for sale. The exclusive package will consist of a poster/print of the cover image without cover lines (682mmm x 515mm) plus a special edition of the magazine again with no cover lines. This package is available exclusively via the online Time Out shop for £12. The set will be limited to 5000 copies. The edition is available now on pre-order. UPDATE: All proceeds from each sale will now be donated to the Haiti earthquake relief effort.